Prayer impacts people and situations. We can lift them up when they doubt God’s involvement and power. We can pray that peace will replace worry. We can ask God to heal physical, emotional and spiritual wounds. We can ask God to give guidance for a situation. And then to give them the power and tenacity to follow through. We can pray that people will come to know and accept God’s love (as shown through salvation). Because our God is unlimited, we can pray for any and every need. Prayer doesn’t work because of what we pray, but because of WHO we pray to: the Creator of heaven and earth, including each person. Spend some time today in this free and POWERFUL act of kindness. You can practice being kind by leaving me a comment. Want to know what other acts of Kindness are on the list? Go to my Landing Page . . . Scattering Kindness: A 31 Day Adventure of Intentional & Random Acts of Service. Please leave me an idea or two that I can add to my acts of kindness list. The idea can be intentional or random. Know Why God Answers Prayer? Thanks go to Elizabeth Symington for making my #Write31Days button and basic graphic for the kindness quotes. Elizabeth is writing a 31 days series on Summer of Service in Yosemite. I think of prayer as a super power I can have. Only the power does not come from me, it comes from God. And in order for me to access this superpower, I need to be in a relationship with God. Now let me tell you why I am grateful 4 3 things about prayer. ONE. It is a way I get to know God’s will for my life. God wants to talk to me. He wants me to know the plan He has for me. And one way I get to know His will is by praying. However, in order for me to hear God, I will need to schedule time in my days to be quiet before Him. Read this post, 14 Ways to Determine God’s Will, this post, 3 Conditions to Finding God’s Will, and this post, Seven Ways to Help Your Child Hear God’s VOICE, for other ways to hear and determine God’s will. TWO. I receive perseverance, power and the ability to endure my trials and tribulations. We will have tribulations in this world. This word affliction/tribulation (in the Bible, Romans 12:12) has the connotation of deep, serious trouble. It can also be “an internal pressure that causes someone to feel confined, restricted without options or any way of escape.” Prayer helps me to overcome and even be victorious. THREE. Prayer changes events and people. These changes are not just recorded in the Bible. I have seen and heard of the following happening because of prayer: conquered elements, healed diseased, and restored life (emotionally, physically and spiritually). Your Turn . . . What is your attitude to prayer? . . . Why are you grateful for prayer? Today is #National Simplicity Day. When was the last time you looked to simplify your life in terms of goals, balance, meaning, and social media? Answer the questions below to get you started on this reflection. How balanced is your life between the various areas like sleep, work, and recreation? Are you spending quality time with the important people in your life and on projects that advance you towards your goals/dreams? Is your spiritual life a relationship that you cultivate? One of my goals for this summer is to finish unfinished projects. And one of these projects is decluttering. Yesterday, with the help of my daughter, I went through ALL of my clothes. I tried on everything and only kept what I really liked or loved. The rest is in the give-away pile. I have given myself a month to mend (mainly shorten) the clothes that need it. Otherwise they, too, will be given away. And after a month, I will check to see what I’ve actually worn. My tentative goal is to do something like Project 333. I still need to do more work in my closet. I am surprised at how many non-clothes items are in there. I am also surprised at how many scarves I have. Tons, I tell you, tons! I tend to work too much. As a result I neglect the important people in my life. That is one reason I wrote a Summer Bucket List. I want to make sure I have friend-balance in my life. So far this summer I have done well with having “dates.” Read #4 for an update. These non-romantic times have been fun. I’ve eaten, chatted, walked, viewed vacation photos, and crafted. It may seem weird to some to have to schedule in dates, but I am finding that works for me. One thing that gives meaning to my life is a relationship with God. I want to and need to spend daily time reading and meditating on Scripture. I need to and want to spend time talking and listening to God. And finally I need to and want to spend time at church and with the people of the church. This type of focus keeps me maturing and balanced. Also to add meaning to my life, I am thinking about what’s important to me. I am listening to an audiobook, Thrive. Arianna Huffington wants us to consider four areas to get back to living a life that counts: wonder, giving, wisdom, and wellness. I want to focus on these as well. Joelle from 21 Delights wrote a list (of 21 things) that brings meaning to her life. Her top 10 are as follows … her husband … her children … her relationship with the Divine … Her extended family … witnessing goodness … life stories … friendship … solitude … Music … and art. Go here to read the complete list and post about why she wrote it. I haven’t written such a list yet. What would your list include? What do you want to do more of? Less of? Read how a STOP DOING list is helpful. Social media use can, at times, consume way too much of my time. I go on for just a quick minute. And then an hour later I am still on there. I want to and need to declutter that area of my life, too. In conclusion, in honor of National Simplicity Day I am reading a real book and not something from social media. I am reading Walden by Henry David Thoreau. He was an advocate for living a life of simplicity. If you’ve read this book, what are your take-aways? Your Turn . . . How “simple” is you life? . . . Where would you like to make a change in the areas of GOALS, BALANCE, MEANING and/or SOCIAL MEDIA? Related Posts . . . Check out the article that was the brainchild of this post: NATIONAL SIMPLICITY DAY from the National Day Calendar website. This is my take on a prayer pumpkin. Do you pin many ideas to Pinterest? Do you do many of the things you’ve saved? Every once in a while I do! The latest thing I crafted was from my Fall Pinterest Board. 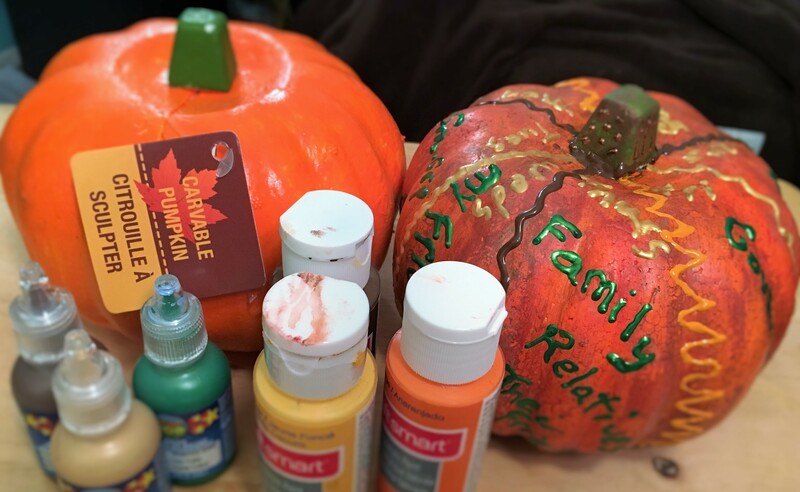 It combined three things I love – Fall decor, puff paint, and prayer. I created a prayer pumpkin. The original post is here at Coffee with Us 3. 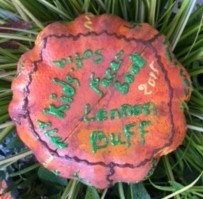 Jamie used real mini pumpkins and a metallic sharpie to write names on the pumpkins. Read her post for all the details and to see her finished work. Leave her a comment while you are there. I didn’t want to spend a lot of money on this project. So I went to the Dollar Store and bought one of those BRIGHT orange foam pumpkins. Boy, was it bright! Here is how I transformed if from BRIGHT to just right. This craft cost $1 as I already had the bottles of paint. I toned down the orange by dry brushing on brown acrylic paint and wiping most of it off. Then in a few spots, I dry brushed orange and yellow acrylic paint over the brown. Again I wiped most of it off. Using puff paint I divided my pumpkin into 7 sections. I wrote the days of the week at the top. And in each section I wrote what I am praying for that day. I have never prayed according to day before. So I spent time brainstorming what could go in each section. The list I narrowed it down to as follows. Here is the bottom of my pumpkin. This is an easy craft and prayer project to do with any age. 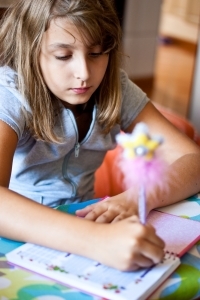 Instead of puff paint which might be hard for the younger kiddos to use, try letter, word or picture stickers. Of course the 7 sections are optional. 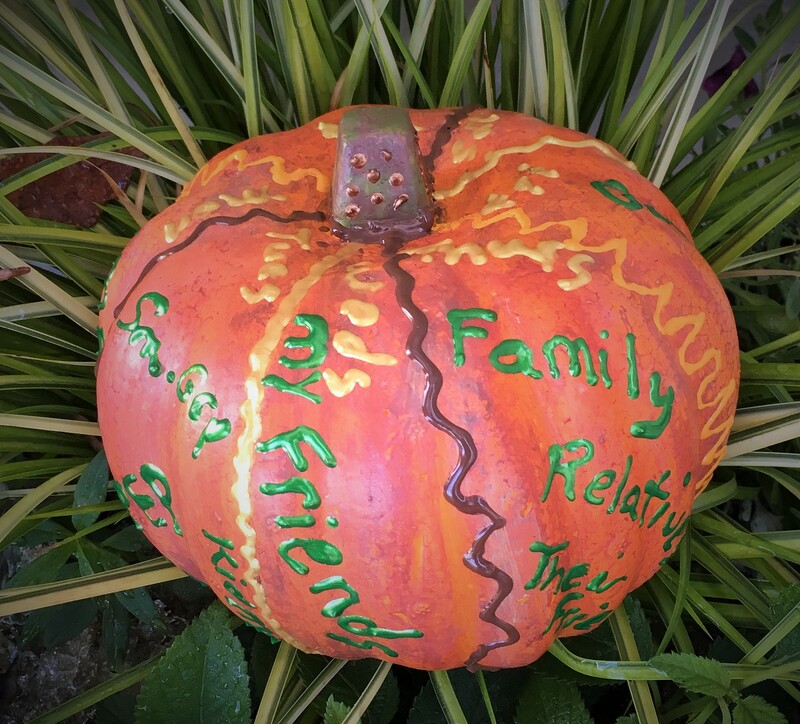 You could do what Jamie did and devote one pumpkin to each family or group/need. I love this newest addition to my Fall decor collection. And I am intrigued to see how this new way of praying goes. Your Turn . . . What do you think of this idea? If you make one, please link back to your project as I’d love to see your take on a prayer pumpkin. . . . Have you ever prayed certain things for each day of the week? If yes, what was your experience? Do you have any tips? I am linking up with Works For Me Wednesday hosted by Giving Up On Perfect. Be sure to go there to check out all the other ideas. Sometimes I journal during my devotions. I write down insights, questions, responses, and prayers. What does it mean to have devotions or a quiet time with God? It simply means putting aside time to engage in prayer and reading (the Bible or other spiritual literature). The prayer time is more than talking to God. It is also listening to Him. I find that I “hear” most of His responses when I read the Bible. Go here to read about how to hear God’s voice. My reading is usually purposeful. I.e. I spend time (daily) reading the verses, chapter, or book of the Bible that my Wednesday night study group is studying. I read to understand. And I read to see what application can be made to my life. In other words, I don’t read just to read. Having devotions in the mornings has become a habit again. I prefer morning devotions because then I know it will happen before the rest of the day’s agenda interferes. And at this time of day I can give my undivided attention to praying and reading. But like all habits (with me any way) I know that it can be easily broken if I don’t watch my environment and my motives. Go here to read how I prepare my environment for maximum adherence to this habit. I need to periodically go over my motives for having a regular quiet time. Knowing these reasons helps increase my stick-to-it-ness. In fact this step is helpful for maintaining any habit. And there are definite reasons I want to spend some extended time with God each morning. Here are 3 reasons. Reason 1: Transformed Mind. It is easy for me to think mainly of myself and to think badly of people, situations, God, and even myself. The media and culture I live in support this kind of narcissistic, distorted thinking. However, when I spend purposeful time in the the Bible, the WORD of Truth, my thinking becomes transformed. It goes from thinking according to the world and my natural reasoning to thinking thoughts aligned with God’s Word. Read and ponder Romans 12:1-2. Reason 2: Transformed Actions. How and what I think upon radically affects what I do. How I behave shows what I think/believe in. I want my actions to reflect well on God. I want my behaviour to be consistent with Biblical mandates because being in alignment will bring me peace and wisdom. And mainly I want to be transformed to show that Christ indeed lives within me. Read and ponder Matthew 5:16 . . . . Psalm 119:165 . . . . Proverbs 22:17-21 . . . . Galatians 2:20. Reason 3: Transformed Relationship. In order to go from strangers to intimate friends, steps need to be taken in order to transform the relationship. To deepen any relationship there needs to be time and energy spent on that relationship. This is also true of a relationship with God. Engaging in spiritual disciplines like praying and reading the Bible help us know God better and thus deepen our relationship with Him. As my relationship with God grows, I’ve noticed the following . . . I grow to love Him more. I become more in awe of who He is and what He does. My desire to obey increases because of the thinking transformation that is taking place. I don’t always understand God’s ways and thoughts. But I have increasingly more trust in how He governs. I think this is true because I am knowing Him better and better (mainly through my devotions) as the years advance. Read and ponder John 15:13-15 . . . . Isaiah 55: 8-9. These are only 3 reasons for having regular quiet times. These are my top 3 for this stage in my life. Your Turn . . . What are some reasons you have devotions? NOTE: This post is written for the Blogging From A to Z Challenge. There are 22 categories and my category is MI = Miscellaneous. During the month of April I will post 26 times finishing up posts that have been in my draft fie for at least a year. For a list of all the posts go to the A-Z button on my header. Today’s letter is R. The topic is REASONS to have a quiet time. This past year I was part of a small group called The Power of a Praying Woman. In fact, I took that class twice. It was an awesome, instructional time of learning how to pray out loud. Lynette did an awesome job facilitating this group. Besides the instruction, we also had time to actually put the instruction into practice via prayer at each session. We received benefits from praying together as a group. I came up with 10 benefits. Because you are accepted by group members you learn to accept yourself. Church attendees, family, work mates and friends become Christians and receive other miracles in their lives. The answers to prayer bind you together as a group. Your love for each other and for God grows. Your faith also grows. You become aware of the stressful and crisis situations in one another’s lives. So now you know how to pray specifically for one another. You are surrounded by God’s presence. You (eventually) lose your fear of praying out loud because of the practice (of prayer). You learn how to pray out loud by hearing more experienced people pray. You realize that you are more like each other than different from each other. So you learn to replace your fear and suspicion of one another with acceptance and love. You get to know one another better. You receive God’s love though the other members of the group. Which of the above benefits have you received because of praying with a group? What benefit would you add that is not on the list? Are you part of a praying group? Why or why not? What will you do this week because of reading this post? When I moved back to California my brother-in-law suggested I get into a prayer group. He said I’d need prayer support to get through the coming years well. I have been with my prayer partner for seven years now. The past years were full of divorce proceedings, completing my BA and MA, and parenting my adult children. I have benefitted from this relationship. My prayer partner has been a friend, a mentor, and a mighty prayer warrior. I think that every Believer would benefit from having a prayer partner (or two). Below are eight tips for finding a prayer partner. Pray. Ask God for help in this process. Know what you want. Make a list of things you want in a prayer partner: stays on topic, loves the Lord, believes in the power of prayer, keeps confidences, etc. Read. Read A Dozen Rules for Prayer Partners, Part 1 and A Dozen Rules for Prayer Partners, Part 2 for ideas on how to structure your prayer partnership. Search. Look to see if something is already set up. I.e. If you’d like to pray for your children and their school, there might be a prayer group already in place. Observe. When it’s prayer time in your small group, church service, or impromptu prayer times, observe how others pray. Is there a person or two with whom you click? Note who brings you a feeling of safety. Who encourages, motivates, and builds your faith because of their prayers? Brainstorm. Set aside some time to brainstorm a list of possible people. At this point it doesn’t have to be realistic or possible. Then look at your names to see if these folks share any common traits. Practice. Look at your list and ask a few of your choices if they’d like to get together to pray for a onetime event. Look at this as a “date.” If it works out well, ask them if they’d like to commit to a prayer partnership with you. Ask. After you’ve prayed and done all the ground work, go ahead and ask. There might be a “no” answer. Don’t take it personally. Go on to the next person. I asked four women to pray about being a prayer partner with me. For three of them it wasn’t a good time or not something in which they were interested. But one said “yes.” And it has been a growing, powerful, exciting seven years. Do you have a prayer partner? Why or why not? If yes, how did the partnership come about?